Chattanooga is rich in history, from the nation’s first and largest military park, the Chickamauga and Chattanooga National Military Park; Ross’s Landing on the riverfront, a Cherokee removal site now memorialized by The Passage; the electronic map displaying the battle of Lookout Mountain at Battles for Chattanooga; the Chattanooga Choo Choo Terminal Train Station Complex built in 1909 to museums like the Tennessee Valley Railroad Museum, Bessie Smith Cultural Center and the International Towing & Recovery Museum and Hall of Fame. 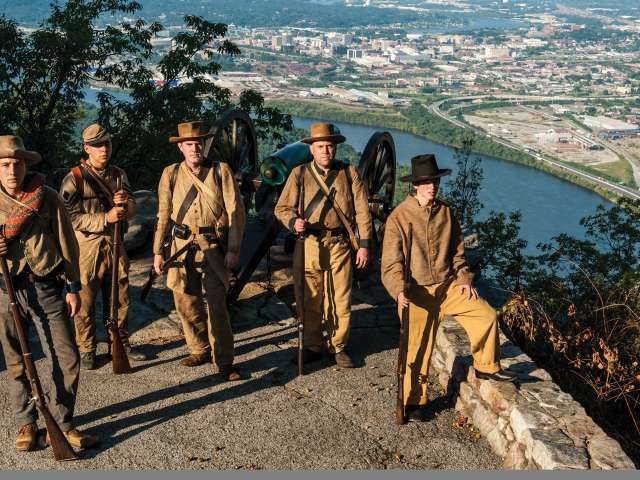 Because of Chattanooga’s strategic location, river and rail systems, some of the hardest fought and most complex battles happened during the fall of 1863 on Lookout Mountain and Missionary Ridge. Because of Chattanooga’s strategic location, river and rail systems, Chattanooga was considered the gateway to the Deep South and an important location for both the Union and the Confederate armies. The Chickamauga Chattanooga National Military Park stands as the oldest and the largest military parks in the nation and was established through the efforts of Civil War veterans who came together from both armies in 1889. This Civil War battleground not only preserves, but also honors heroism, reconciliation and national reunification. During the Civil War, the Tennessee River was a strategic means of transportation for both the North and the South. To learn more about the role the river played, take a cruise aboard the Southern Belle Riverboat or the Chattanooga Ducks. For information on our local battlefields, please click HERE. For information on our Tennessee Civil War Trail, please click HERE. Ross’s Landing, on the Chattanooga Riverfront, was established in 1816 by John Ross, a Chief of the Cherokee Indians. This area consisted of a ferry, warehouse and landing. With the organization of Hamilton County in 1819, Ross’s Landing served not only the Cherokee trade but also as a convenient business center for the county. In 1838, Cherokee parties left from Ross’s Landing for the West on what became known as the Trail of Tears. Ross’s Landing Park and Plaza encompasses a four-acre area surrounding the Tennessee Aquarium and overlooking the Tennessee River and scenic landscapes. The park includes green spaces, a playground, a pier and The Passage, an area where people can play in water cascading down steps alongside six-foot clay medallions set into the wall representing specific aspects of the Cherokee tribes’ history. A driving tour guide of the newly signed Trail of Tears route is now available. Click HERE for a driving map through Hamilton County. Click HERE for a driving map through Chattanooga. Today, you can still be a part of the “Golden Age” and take a ride aboard a train at the Tennessee Valley Railroad or ride up Lookout Mountain on the steepest passenger railway in the world, the Lookout Mountain Incline Railway. Read more about Chattanooga’s Train History.